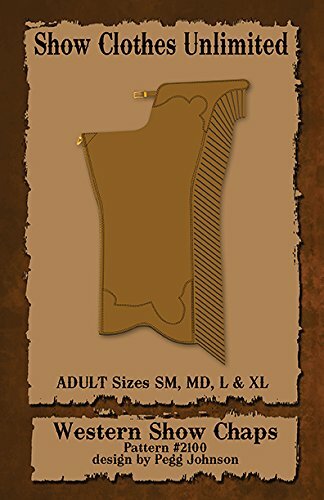 MISSES'/MISSES' PETITE HISTORICAL COSTUME SEWING PATTERN. 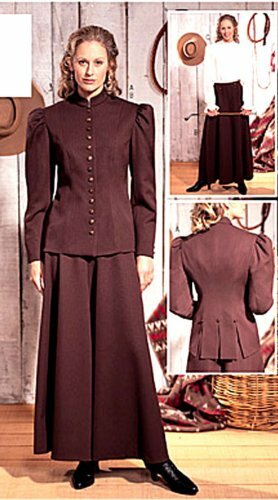 Fitted, lined jacket, below hip has collar, princess seams, back slits and long two-piece sleeve with button trim. Very loose-fitting, flared culottes, ankle-length has front inset with button trim and back zipper. 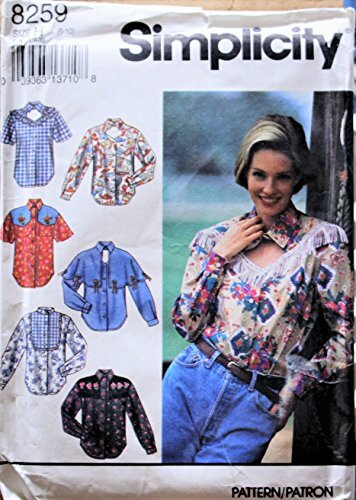 · Very loose-fitting blouse has collar, contrast yokes, back button closures, long sleeve with ruffled cuff and purchased trim. 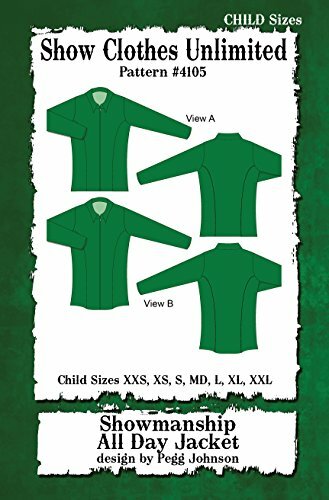 View A, B, and C are traditional 19th century loose-fitting shirts, in men's sizes 36 to 46. all view have a pointed collar, shaped back yoke, long sleeves with sharped cuffs, and a shirt-tail hem. View A is simple to sew; with a slashed front opening which laces up. View B adds a removable button-front bib, designed for protection from steers; horns (or the cold!!). View C was worn by firefighters, with a bib shaped in their traditional emblem. 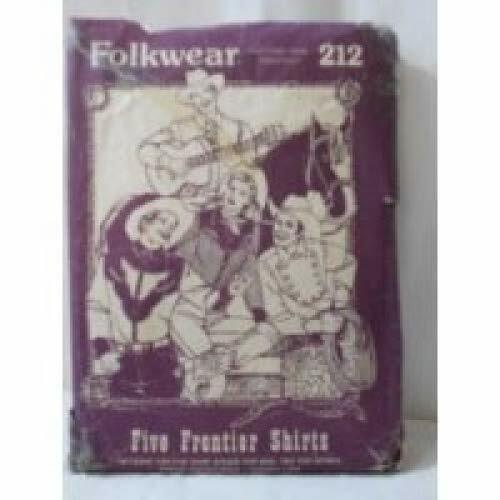 Contemporary Western Shirts such as view D and E (sized for men and women) are narrower, featuring decorative yokes. both finish with "smile" pockets and piping trim. View D has a designer's original Bull;-head yoke and decorative sleeve placket. View E has a simple curved yoke. 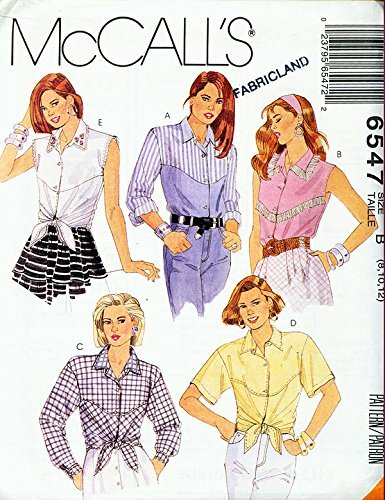 Butterick 4090; ca. 1980s; Misses' Skirt. 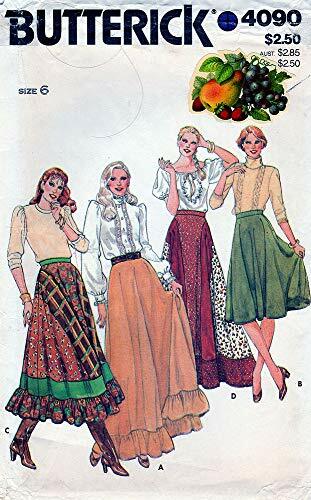 Flared skirt in three lengths have straight waistband, side seam zipper closing, with or without contrast panels, hemline ruffle and hemline band. Topstitch trim. Purchased tops. PATTERN ONLY. 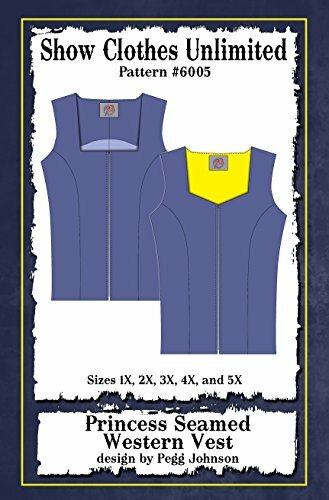 Plus sized princess seamed, western show vest pattern features front zipper and your choice of modified sweetheart neckline or square neckline. Instructions included for using facings or a full lining for both views. Printed on lighter weight velum paper, the pattern is folded to the traditional pattern sizing. The instructions are printed in an easy to follow colorized booklet. Both pattern and instructions are conveniently enclosed in a resealable plastic bag. NEW Western Show Chap Pattern. Available in adult sizes.. Single back concho with fringed leg. New features include a wedge insert under the bottom cuff to lay over the instep better, and a spur slot. Printed on lighter weight velum paper, the pattern is folded to the traditional pattern sizing. The instructions are printed in an easy to follow colorized booklet. Both pattern and instructions are conveniently enclosed in a resealable plastic bag. 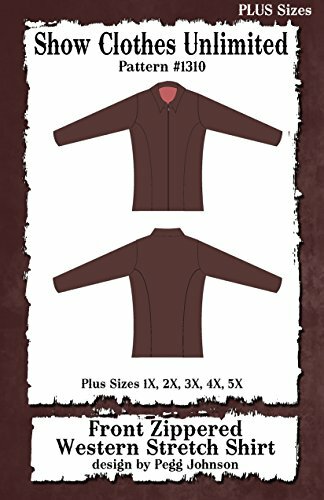 Plus sized front zip, princess seamed, western pleasure shirt has two piece collar. Form fitting shirt is designed for medium lycra or stable knit fabric and may be worn tucked in or un-tucked. Printed on lighter weight velum paper, the pattern is folded to the traditional pattern sizing. The instructions are printed in an easy to follow colorized booklet. Both pattern and instructions are conveniently enclosed in a resealable plastic bag. 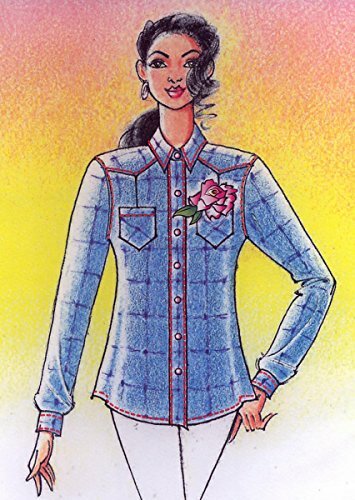 Cabbage Patch Kids Patterns: Pony & Western Wear and Butterick ~ Excellent/NEW!